Anthropologists have long been keen to adjust their research methods to the changing social and cultural worlds they are studying and to the changing questions they are addressing. Multi-sited, urban, digital and multispecies ethnographies, for example, belong to the manifold ways in which anthropologists have developed alternative approaches to the presumably classic village-level study; and a closer look at even these classic studies reveals that most of them have not been as limited as they are often portrayed. 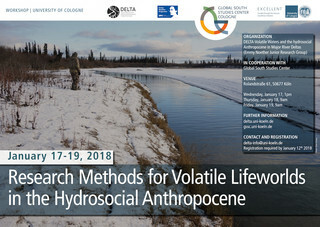 If adjustments and fine-tuning of ethnographic methods are necessary to better understand contemporary lifeworlds and produce insights that contribute to current debates, what methods do we need to study the social, material, cultural and economic volatilities that characterize the lives of so many people today? In the contexts of global economic booms and busts, of population shifts and identity politics, of climate change, hydrological megaprojects and social movements, how can we study the ways in which people plan their lives, remember their pasts and make ends meet, how they dream and what they fear, and how these macro dynamics are imbricated into their everyday lives? If change and uncertainty have replaced stability and continuity as the core principles of social life, what ethnographic tools may serve to capture and understand these worlds? In this workshop, we will discuss and develop such methods in relation to watery lifeworlds. 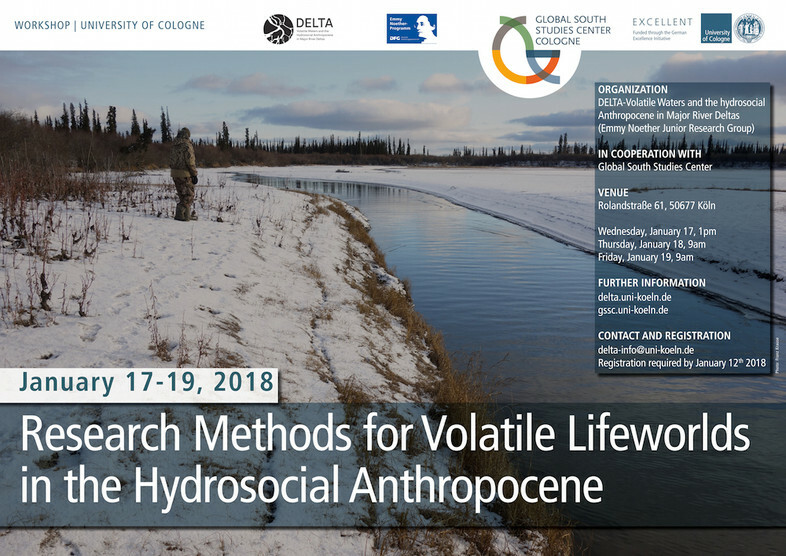 We will focus on research contexts that are characterized by what can be called the hydrosocial Anthropocene. ‘Anthropocene’ here refers to the realization that human activities may have global geologic impacts comparable to plate tectonics and solar radiation. ‘Hydrosocial’ points to the recognition that social and hydrologic relations often closely correspond, in that water flows may mirror political and economic power, and human subjectivities may be shaped by the qualities, quantities and timings of water. 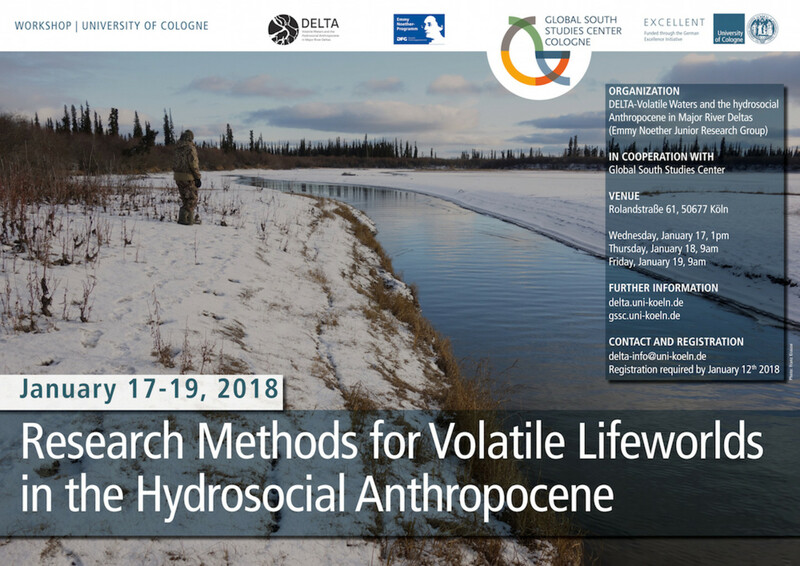 Together, these terms may guide our attention to the ways in which differently situated humans – as geomorphological and hydrological agents, and as inhabitants of wet places – participate in the formation of waters and their absence. The hydrosocial Anthropocene is shaped by the volatile dynamics not only of economies and identities that have become part of so many people’s lives today, but also by those of water and its corollaries – sediments, erosion, ice, fish, floods and droughts, among numerous others. Having noticed how well established the conceptual vocabulary about these issues often is, but how poorly developed the respective practical methods tend to be, we will concentrate on the latter. We will establish a conversation between more junior and more experienced researchers about the potentials and limits of old and new field methods, and we will discuss the practical and ethical aspects of their application. Thereby, we will elaborate a set of tools that may help us to gear our attention to the questions that matter to our interlocutors in the field, and to produce knowledge that speaks to current debates in academia and public discourse.